Summary: An unhappy puddle feels like it’s too big compared to the smaller puddles surrounding it. “If this rain keeps on, I’ll soon be a POND.” And things happen that aren’t always pleasant. A fishy-smelling seagull swoops in. Kids run through, bouncing a basketball. Worst of all, a poodle stops by. “‘No piddle,’ Puddle cries. ‘No, NO!’” But it’s too late, and the puddle gets a splash of yellow. The sun comes out, the other puddles dry up, and the puddle is alone. As the kids run in from recess, they notice a rainbow reflected in the puddle, and one girl stays behind to reach out (hopefully not where the poodle peed) and watch the colors shimmer. All of puddle’s troubles are forgotten as it makes a connection with the girl. 40 pages; ages 4-8. Pros: Is this the first book ever to be narrated by a puddle? 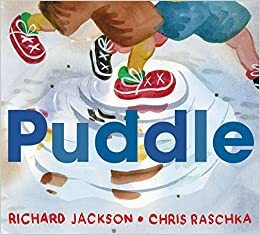 The brief rhyming text and illustrations that show a puddle’s perspective share a sweet message about love and friendship. The inside flap summarizes with an acrostic poem: Puddle Understands Despite Deluge Love Everything. Cons: With that sun shining, puddle’s days seem numbered.